Family Matters: One Roof, Three Generations, Many Decisions To cope with the hard times, millions of families have pulled together — stacking two, three, even four generations on top of one another. An NPR series explores the lives of three multigenerational households struggling with issues of money, duty and love. Kelley Hawkins (left) smiles with her grandmother AnnaBelle Bowers, 87, while at lunch in Harrisburg, Pa. Kelley shares full-time care of AnnaBelle with her sister-in-law LaDonna Martin. Both are nurses with two children each, and move Annabelle, who has limited mobility, every two weeks from one home to another. AnnaBelle talks to her granddaughter Carley (right) and Carley's friends after they returned from lacrosse practice. "I'm not rich money-wise, but with my family I'm a millionaire," AnnaBelle says. 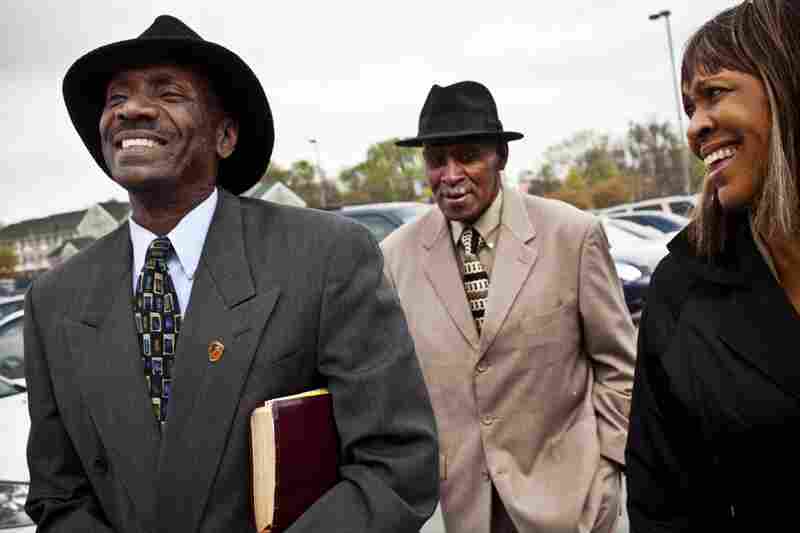 Natasha Shamone-Gilmore walks to church with her husband, Curtis (left), and her father, Franklin Brunson, 81, in Capitol Heights, Md. She has taken on the daily challenge of caring for her father, who is suffering from mild dementia. Her son Nicholas, 24, also lives in the family home. Natasha Shamone-Gilmore has opted to place her father in a full-time adult health center during the day while she works for a nonprofit and her husband works for a regional transit system. 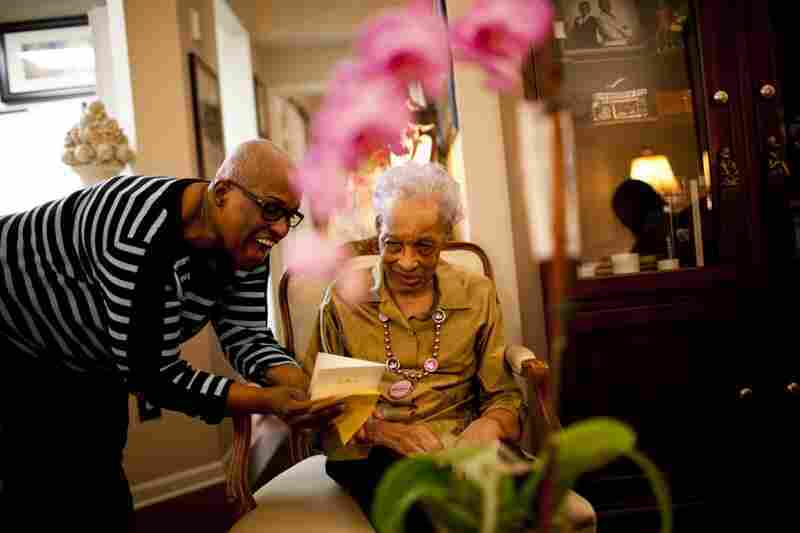 Geneva Hunter (left), who runs the secretarial operations for a Washington, D.C., law firm, decided to take a hands-on approach to her mother's care and moved Ida Christian, 89, into her home. 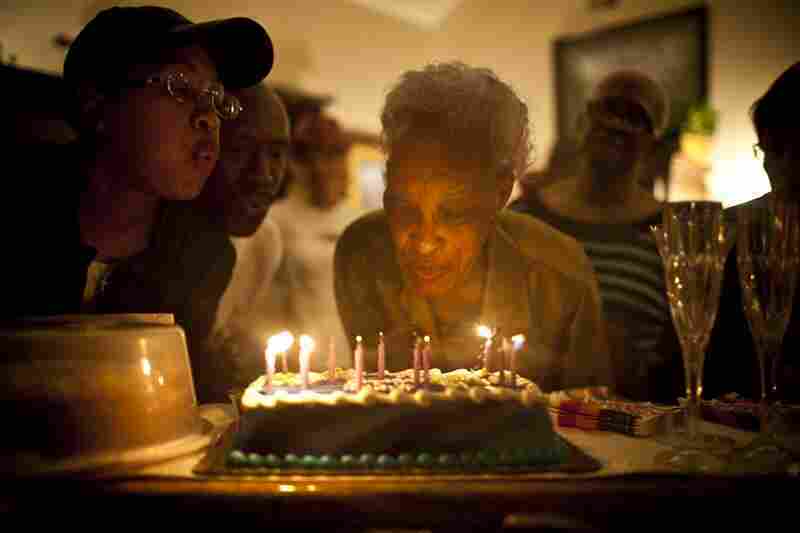 Ida Christian, who suffers from dementia, gets help from her granddaughter, Yolanda Hunter (left), in blowing out the candles on her birthday cake. Yolanda quit her lucrative job to become Ida's full-time caregiver. The Great Recession slammed into all age groups, flattening the career dreams of young people and squeezing the retirement accounts of middle-aged savers. 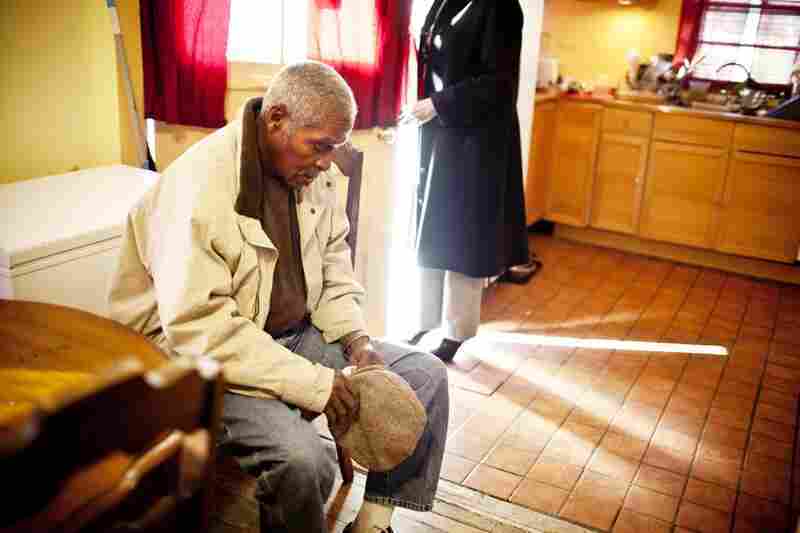 It financially crippled many elderly people who had thought they could stand on their own. To cope with the hard times that began five years ago, millions of families pulled together — stacking two, three, even four generations on top of one another. Between 2007 and 2009, the total number of Americans living in multigenerational households shot up more than 10 percent, from 46.5 million to 51.4 million. That's the largest number of Americans living in multigenerational households in modern history, according to the Pew Research Center, a nonpartisan research group. Now, even as the recovery gains steam, record numbers of people are still living under a roof where adult children, middle-aged parents and elderly grandparents must learn to live together. On Tuesday, NPR's Morning Edition begins a two-month exploration of this increasingly common experience. In a series called "Family Matters," reporter David Greene will take listeners on a journey, deep into the lives of three families struggling with issues of money, duty and love. At NPR.org, stories will delve into the financial issues facing these three families — and millions of others like them. Among the topics to be examined: the need for financial planning; the options for elder care; costs of do-it-yourself care for the elderly; long-term care insurance; college costs; and reverse mortgages. While people of all ages are living in multigenerational homes, this series will focus on those in the middle — the millions of people sandwiched between their aging parents' growing needs and their children's "launch" costs — from first-car purchases to higher education. The baby boom generation often is defined as Americans born between 1946 and 1964. But the peak of the boom covered the mid-1950s through the early 1960s. Those are the people now in their late 40s and 50s — the group that may have assumed these would be their best years financially. In the past, this middle-age phase marked the highest earning and saving years — the period after the kids were grown and the parents gone. But for this generation, the middle years have gotten tougher. First, this group tended to marry and have children later than previous generations. And "launch" times have gotten longer for their children as the need for education has increased. As a result, people in their 50s often are still supporting children who, in theory, are adults. Adult population, 25 and older. Highlighted bars show the ages of the people born during the peak years of the baby boom. Meanwhile, elderly Americans are living longer. In 1950, U.S. life expectancy was just over age 68. Today, it's nearly 79. In many cases, as people live longer, they are piling up higher medical and personal care costs, while draining the savings that might otherwise have served as an inheritance for younger generations. The price of getting help, such as that provided by long-term-care insurance, has gotten much steeper in recent years. Yolanda Hunter, 43, is one of the people who opened her door to NPR. The Maryland resident is struggling with the costs — physical and financial — of caring for her grandmother. "I used to hear about people saying, 'Oh you know, we got to put our parents in a home, we can't deal with it anymore,' " she said. "And I used to think, 'Oh, how cruel are you?' you know, but now? I understand how people get to that last possible moment — it takes over your entire life." And just as record numbers of families were dealing with the impact of having slow-to-leave children and long-to-linger parents, the Great Recession hit. That made everything tougher. During the long and brutal downturn, real estate values plunged and retirement accounts shrank. In 2004, the average household net worth was $95,010 — including home equity. After the recession hit, that figure plunged to just $70,692 by 2010, according to Pew data. So now, the generation in the middle faces an array of financial pressures. How can they make it all work — especially in a multigenerational household? It's a juggling act that can be financially and physically draining. It can also be deeply rewarding emotionally. It is about duty, caring and joy. It's life.